And the winner is… Trish Joyce! Congratulations Trish, please can you contact me and let me know where you'd like your disagreeable sheep delivered. I hope you enjoy your sheep. Thank you to everyone who signed up. There will be another giveaway shortly! This is nice: to take a strip of paper out of hat! In the past I was a bit frustating try to invent sentences in a foreign language that isn't my native one. Now all the constestants are in igual conditions. I've seen a lot of pals winning the models, that makes me happy too. Congratulations, Trish! Enjoy your nice model. i still havent decided where its going …somewhere special..
i just give him the 'look of thunder' and he slinks by…i can not wait…and i feel so very lucky..
thankyou rob thankyou gang.. T.
← No! 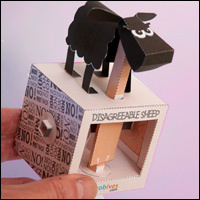 Not the Disagreeable Sheep! No!